FLIR Launches Next-Generation Black Hornet 3 Nano-UAV | FLIR Systems, Inc.
WILSONVILLE, Ore.--(BUSINESS WIRE)--Jun. 5, 2018-- FLIR Systems, Inc. (NASDAQ: FLIR) today announced the Black Hornet® 3 nano-unmanned aerial vehicle (UAV) for use by global militaries, government agencies, and first responders. The Black Hornet Personal Reconnaissance System (PRS) is already the world’s smallest combat-proven nano-Unmanned Aerial System (UAS), and FLIR’s next generation Black Hornet 3 nano-UAV adds the ability to navigate in GPS-denied environments, enabling the warfighter to maintain situational awareness, threat detection, and surveillance no matter where the mission takes them. The Black Hornet PRS has been fielded by over 30 nations over the past seven years and continues to represent the cutting-edge in the combat nano-UAS space, enabling small combat units, SWAT teams, and first responders with immediately available intelligence, target-acquisition, and reconnaissance capability. At 32 grams, the Black Hornet 3 offers the lowest size, weight, and performance for UAS available. Offering improved speed and distance compared to previous versions, the Black Hornet 3 flies 2 kilometers at speeds of over 21 kilometers an hour. The Black Hornet 3 also incorporates sharper imaging processing featuring the FLIR Lepton® thermal microcamera core and a visible sensor to allow greater image fidelity. The design also features an improved encrypted military-approved digital datalink, enabling seamless communications and imagery significantly beyond line-of-sight and in closed areas. 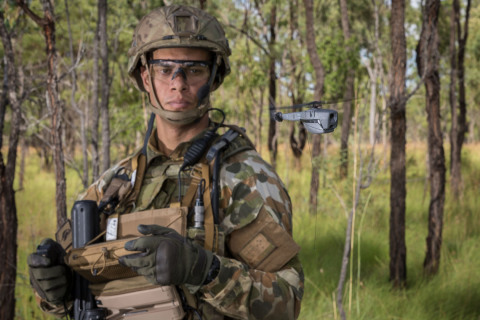 Last week, FLIR announced it had been awarded a $2.6 million order from the United States Army’s Soldier Borne Sensor (SBS) program to deliver the Black Hornet in a first batch order. Units delivered for the SBS program, in addition to units recently deployed by the Royal Australian Army and French Armed Forces, will be the Black Hornet 3. The Black Hornet 3, which includes two UAV sensors, a controller, and display, is sold directly through FLIR and is available today to military, government agencies and law enforcement customers. The latest Black Hornet will be demonstrated at EUROSATORY 2018 in Paris, France from June 11 to 15 in the FLIR booth #A227. For more information about the Black Hornet 3, visit www.flir.com/blackhornet (U.S.) or www.flir.eu/blackhornet (Europe and Asia).